Always keep your pet safe. If you have the habit of leaving your dog out in the yard, make sure he is sheltered from the sun. Your dog must have easy access to fresh food and clean drinking water. Make sure that your dog cannot dig his way out of your yard from under the fence. Reinforce the fence where it is weak in order to avoid this. If you plan to hang up rope from pipes, make sure the structure is sturdy. Do not give old clothes or toys belonging to your kids since your pet might feel encouraged to take others without permission. Whenever you doubt the suitability of a toy, avoid its use. Kong toys are readily available in the pet stores and they can keep your dog busy for hours. Smear your pet’s favorite treat such as peanut butter, cream cheese, sausage mince or chicken broth ice cubes inside the toys. Many kong toys are designated for the dog to roll in order to get the food out. You can even fill them up with dry food or kibble. This is a fantastic way of making things a bit more challenging for the pet. Teach your dog to look at you or “watch” command. Use food to lure her/him. Train in an area having minimal distractions. Teach basic commands like wait, sit or heel etc. You can also use verbal praise instead of food. Your tone of voice also matters. Well exercised dogs are tired dogs that are also more likely to stay out of trouble. If you are busy, arrange for a dog walker to come and take him for daily strolls. Most dogs love car rides. Since it is important to get them out of the yard and home from time to time, car rides in the evenings or on weekends work best. Rides are fun and easy ways to keep dogs entertained. They can also be a great stimulus for the dog’s brain. If possible, become a dog foster parent so your pet gets to interact and play with his own kind. Alternatively, arrange for other pet owners to visit. Enrolling him in a dog day care center is also a great idea. A small wading pool is a fun and easy way of entertaining your dog in summers. You can purchase a shallow, plastic inflatable kiddies pool which is not too expensive. Fill it up with water/sand, balls, toys shredded paper etc. This is sure to keep your dog busy for a few hours. Dogs love to dig, so designate a spot in your yard or garden where he can do so. Fill up the spot with soft sand for him to easily dig it up. In order to teach him that it is okay to dig there, hide a toy in there and then dig it out for him to see. In order to keep your dog busy at home when you are at work, create a small ledge for him to perch upon near the window from where he can keep an eye on the comings and goings of people/cars outside. Make sure the place is safe and comfortable. Both trampolines and hay bales are wonderfully entertaining for dogs and can keep them busy in the yard. Who said child’s playground equipment is for kids only? Dogs can also have fun climbing, hiding or resting in it. You can easily pick up a set for less at a yard sale or on Craig’s List. Hang an old tire from the tree and place some toys or treats in it to get your pet interested. Make sure the rope you use can take the dog’s weight and abuse! Playing treasure hunt is a super way of keeping your dogs busy. It could involve throwing dog food around the garden or hiding the dog’s kong toys and encouraging him to search for it. No more bored pet! 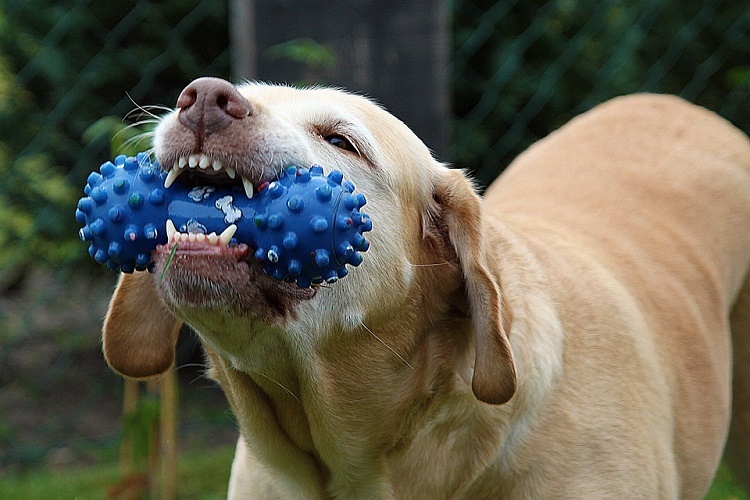 With these 14 easy ways you can keep your dog busy and entertained in the home or yard.